Takakkaw Falls (/ˈtækəkɔː/; also spelled Takkakaw) is a waterfall located in Yoho National Park, near Field, British Columbia in Canada. The falls have a total height of 373 metres (1,224 ft), making it the 2nd tallest waterfall in Canada. The main drop of the waterfall has a height of 254 metres (833 ft). "Takakkaw" translates to "wonderful" in Cree. The falls are fed by the meltwater of the Daly Glacier, which is part of the Waputik Icefield. The glacier keeps the volume of the falls up during the warm summer months, and they are a tourist attraction, particularly in late spring after the heavy snow melts, when the falls are at peak condition. 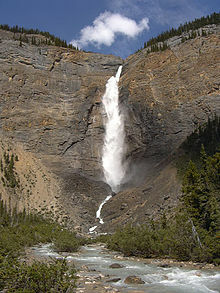 Various sources place the total vertical height of Takakkaw Falls between 302 m (991 ft) and 373 m (1,224 ft). 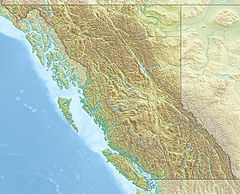 The waterfall was formerly thought to be the tallest in Canada, but a new survey in 1985 found that it is actually shorter than Della Falls on Vancouver Island. The results of that survey also concluded that the main drop of the falls is 254 metres (833 ft) high. The Takakkaw Falls were featured in the 1995 film Last of the Dogmen. A rainbow over Takakkaw Falls. ^ a b c d e f g h i "Takakkaw Falls". Encyclopædia Britannica. Retrieved 25 February 2019. ^ a b c "Takakkaw Falls". World Waterfall Database. Retrieved 25 February 2019. ^ a b Evans, David. "Takakkaw Falls". The Canadian Encyclopedia. Retrieved 25 February 2019. ^ a b c "Waterfalls in the Canadian Rockies: Field, British Columbia". www.field.ca. Retrieved 13 August 2018. Wikimedia Commons has media related to Takakkaw Falls.